The other day, as I was driving along Route 66 into St. Louis, I had my eyes wide open and constantly scanning for a good vantage point to capture the city’s most recognizable landmark, the Gateway Arch. I’d seen lots of images of this monument to the western expansion of these United States, most quite good, but none the way I would want to shoot them. I was in luck, though, because I spotted this cool URBEX (Urban Exploration) vantage point from which to photograph that Arch my way. Mike Olbinski – Awesome shot! Nice find man…hope your Route 66 tour was awesome. Bob Lussier – Very cool. Justin – That is awesome! Loving the series. Wayne Frost – Great, unique take on this landmark. Jan Winther – Great shot again. I like the reflecting on the floor. Eric – Awesome shot! …and that’s my city! 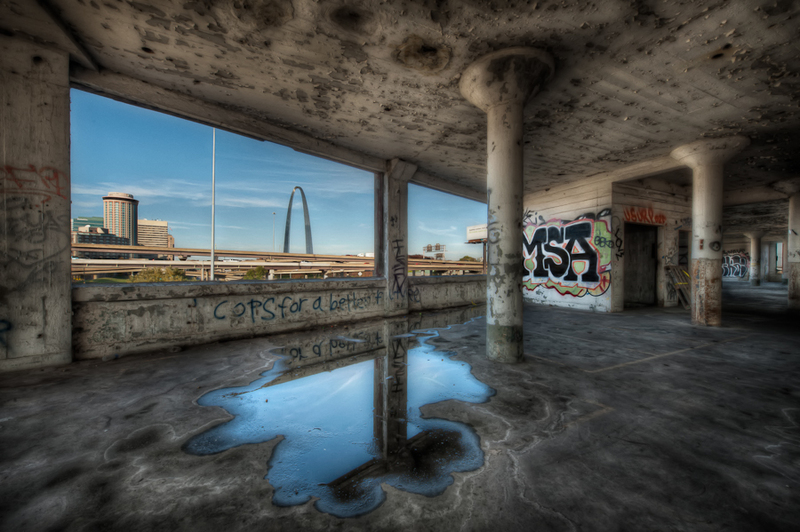 That looks like Powell Square…or one of the buildings in Chouteau’s Landing…very cool area to shoot. bob emmerich – Great capture.